Rays Prospects is starting an analysis of their 30 top prospects in the system. Those on the list we haven't seen already, we have a good chance of seeing in the future. Over on Rays Index, Cork Gaines recently summarized various trade rumors. Several days ago the Rays did some maneuvering around with their 40-man roster to protect a few youngsters from the "Rule 5" draft. See the items at DRaysBay and theSt Pete Times. Of interest to Bulls fans is that Aneury Rodriguez has not been "protected". That implies that the Rays think they can get along without him if another team wants him badly enough. As a reminder, Rays Prospects is keeping track of Rays players playing winter ball. Lastly, for the truly desperate baseball junkies who might be passing by, here's a lead on the reorganization of the Independent Leagues. It’s time, at last, to announce this year’s winners of the Moonlight Graham Award. The Moonlight Graham Award is given each year to the ballplayers (hitter and pitcher) who spent the least amount of time in a Durham Bulls uniform. In the interest of fairness (not that fairness is really an abiding interest here at WDBB) we have established a few criteria for our selection. We exclude players who participated only in playoff games, players who passed through Durham on a rehab assignment, and (for the pitcher award) we exclude position players who pitched in late innings to save the bullpen for another day. Although he spent most of the playoffs with the Bulls, his only regular season appearance was way back on April 14, at Gwinnett. He went 1 for 4 that day. Craig has faced an uphill battle in the Rays organization for the last couple of years, but we have always admired his spirit and his very pretty snap throws to first and second base. Wouldn’t mind seeing him with the Bulls in 2011. In fact, Garcia never quite made it to Durham. Back in June, when the Bulls were in Indianapolis, he came up from Montgomery, appeared in two games in relief, 4 2/3 innings, and then was sent to Charlotte, Florida. He spent July in Florida then went back to Montgomery to end the season. We have never seen him pitch. Congratulations to Craig and Justin! 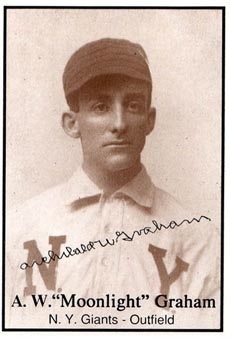 Archibald Graham achieved lasting and national fame as a character in the W.P. Kinsella novel, Shoeless Joe, and then became even more famous when he was played by Burt Lancaster (and Frank Whaley) in the Kevin Costner film, Field of Dreams. As a ballplayer he got two innings in the major leagues as a right fielder for the New York Giants in 1905. He never came to bat. The interest here is that he was a North Carolina native (born in Fayetteville, grew up in Charlotte); graduated from UNC (where he played baseball); and was the older brother to UNC President and US Senator Frank Porter Graham. If you find him an intriguing character, the Wikipedia article is a good start. Then there’s a nice NBC piece done on him a couple of years ago. And a terrific book by Fayetteville writer (and Bulls fan) Brett Friedlander and Robert Reisling, Chasing Moonlight. Copies of the book are in the Wake County Library system and I found my copy at Quail Ridge Books in Raleigh just last week. 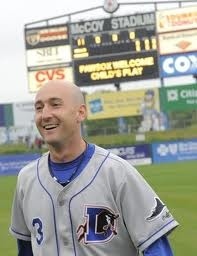 Several more current/prospective Durham Bulls are showing up in the winter leagues. Jim Donten over at Rays Prospects is doing a terrific job with daily coverage of how they are doing, so I won’t repeat that here. However, to add to the list originally reported, catchers Jose Lobaton and Dioner Navarro, and pitchers Brian Baker, Joe Bateman, Carlos Hernandez, and Aneury Rodriguez are spending time in Mexico, Venezuela, and the Dominican. For a glimpse of the life, keep an eye on Nicole Johnson's blog, Life of the Baseball Wife, which has a entry on a Mexican League game and another on what it's like to be called up for the playoffs.